TM 9-6115-651-14&P Figure 4-4. 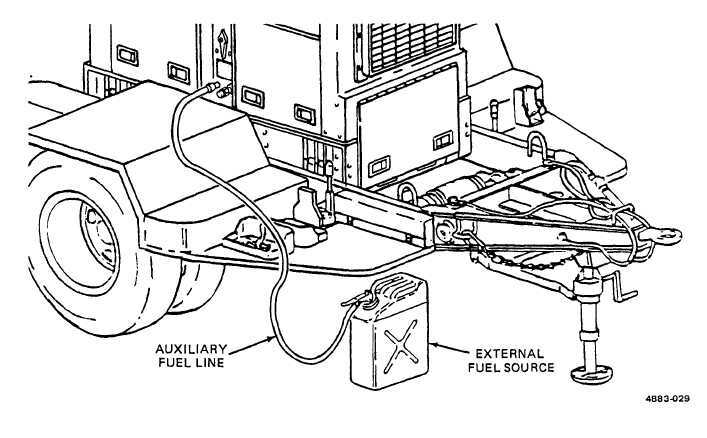 External Fuel Line Connection. Section Il. MOVEMENT TO A NEW WORKSITE 4-3. Dismantling for Movement. Because the power unit is designed to be mobile, a minimum amount of effort is required to relocate to a new worksite. Procedures are as follows: a. b. c. d. e. f. g. h. 4-6 Disconnect power unit from system or equipment being powered. Disconnect ground cable from source of ground and from power unit GROUND TERMINAL. Roll up cable and store in accessory box. Using slide hammer, remove ground rod. Disassemble, clean, and stow ground rod in accessory box. Disconnect power unit from external fuel source, if applicable. Stow any remaining authorized equipment in accessory box. Secure fire extinguisher and fuel cans in their respective mounting brackets. Close all doors on the generator set enclosure. Swing personnel platform into traveling position and secure with two platform anchor quick-release pins.